Early projects such as Bliain Le Baisteach (A Year of Rainfall) (2000) looked at fluctuating annual rainfall patterns in Ireland. Further, Cóisir an Tsionainn (The Shannon Suite) (2003) focused on the four-year life cycle of the wild Atlantic salmon and the effects of overfishing and pollution on the species ability to survive. Projects such as Nobody leaves till the Daphnia sing (2009) examined the implications of contaminated domestic drinking water supplies in Galway and West Limerick. The Marbh Chrois (Dead Zone) (2010) project addressed the impact of two ‘contested’ marine dead zones as a key stressor on marine ecosystems in Donegal, Ireland. In 2011 Softday were selected as one of the winning entries to the prestigious project EUROPE – A SOUND PANORAMA, in Karlsruhe, Germany. The Karlsruhe live concert was recorded by Deutschlandradio Kultur and distributed to all European radio stations. Between 2011 and 2013, Softday collaborated with a number of Irish beekeepers, scientist and the monks of Glenstal Abbey, creating Amhrán na mBeach (Song of the Bees) about the life of honey bees and current threats such as Colony Collapse Disorder (CCD). 2018 Sounds of the Unthinkable, Sirius Arts Centre, Cobh, Co. Cork. 2018 Uisce Salach (Dirty Water) first workshop, Science Gallery, Dublin. 2017 Tidal Scratchings, Shannon Rowing Club, Limerick. 2016/17 (Re)Public, Hyde Park Arts Centre, Chicago, USA. 2015 Et si on s’était trompé? (What if we got it wrong?) Centre Culturel Irlandais, Paris, France. 2015 Hyphae, group exhibition at the Bourne Vincent Gallery, University of Limerick, Limerick. Ireland. 2015 Chant des Abeilles (Song of the Parisien Bees), Centre Culturel Irlandais, Paris, France. 2015 Song of the Urban Bees re-mediated, Limerick City Gallery of Art, Limerick, Ireland. 2015 World Listening Day Soundwalk, O’Brien’s Bridge, Limerick, Ireland. 2015 Sound Kitchen 2015, Prague Quadrennial of Performance Design and Space, Prague, Czech Republic. 2015 Sonic Vigil 9, Cork, Ireland. 2015, 2nd Annual Acouscenic Listening Intensive, University of Limerick, Limerick. Ireland. 2014 Amhran na Beacha - Song of the (Urban) Bees, Crescent Hall, Limerick, Ireland. 2014 Audio Fabric: Socio-Sonic Textures In the Real World, The Irish Sound, Science and Technology Convocation. 2014 Art, Technology and the Natural World, Harn Museum of Art, Gainesville, Florida, USA. 2014, 1st Annual Acouscenic Listening Intensive, University of Limerick, Limerick. 2014 BZZZ Sound Art Festival, Harp Art Lab, Harplinge, Sweden. 2014 Supermarket 2014, Stockholm Independent Art Fair 2014, Sweden. 2013 Aspiration, live performance with Áine Phillips, H-Q Gallery, Limerick, Ireland. 2013 Amhran na Beacha (Song of the Bees) Glenstal Abbey, Murroe, Co.Limerick, Ireland. 2012 Galway Jazz Festival, NUG, Galway, Ireland. 2012 The Sonic Abyss, Drogheda Arts Festival, Co.Louth, Ireland. 2012 21 Proposals for the Turbine Hall, Ormston House Gallery, Limerick, and the Crawford Art Gallery, Cork, Ireland. 2011 Re-mediating Joris Ivens, Corona Cork Film Festival 2011, Ireland. 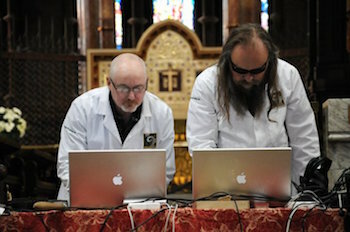 2010 Sonic Vigil V, St.Finbarr’s Cathedral, Cork, Ireland. 2015 Residency at the Centre Culturel Irlandais, Paris, to work on the “Song of the Paris Bees”, project. 2014 Limerick National City of Culture commission for Amhran na mBeach - Song of the (Urban) Bees. 2013 CREATE, Artist in the Community Scheme Award. 2011 Cork City Council commission for Re-mediating Joris Ivens, Corona Cork Film Festival 2011. 2011 CREATE, Artist in the Community Scheme Bursary. 2011 The Goethe-Institute of Belgrade, Deutschlandradio Kultur, Radio Belgrade, the European Broadcasting Union’s (EBU) Ars Acustica Group, the Institute for Music and Sound at the Centre for Art and Media Technology in Karlsruhe (ZKM) Germany, Award. 2015 "From a Year of Rain, to Fifteen Years of Art-Science with Contested Watery Issues", academic paper for "Fluid Currents: Water, Art and Ecology", 2015 SECAC Conference, Pittsburgh, USA. Taylor, S., Fernström, M. 2014 Marbh Chrois (Dead Zone), in Water is in the Air: Physics, Politics and Poetics of Water in the Arts, Annick Bureaud (Ed. ), Leonardo/ISAST, MIT Press, Leonardo ebook series, Kindle Edition. Taylor, S., & Fernström, M. 2012 Marbh Chrios. Leonardo, 45(2), 192–193. Fernström, M., & Taylor, S. 2010 Exploring ambient sonification of water toxicity. In Proceedings of the 2010 International Conference on Auditory DisplayWashington DC, USA: ICAD. Fernström, M., & Taylor, S. 2001 Blain le Baisteach - a Year with Rain. In Proceedings of the 2001 International Conference on Auditory Display. Helsinki University of Technology.